John Gruber of Daring Fireball is the most influential Apple pundit on the web, but readers often complain about the lack of comments on his website. In fact, Gruber’s site is famous for not having comments. In an age when every website falls over itself to accommodate reader interactivity, Gruber stands alone. He has stubbornly resisted adding comments to his site for years. Gruber has explained that he dislikes comments because they distract from his all-important voice. This is exactly the kind of egotistical statement that makes him unpopular with many people, especially other writers, but a must-read pundit. But Gruber is about to get comments, whether he likes it or not. The team behind MacHeist has just launched DaringFireballWithComments.net— a website that mirrors Gruber’s site with, you guessed it, comments. The lack of comments on Daring Fireball is the thing readers most often ask about, Gruber has noted. Casasanta said he has dreamed about the adding comments to DF for years, and pulled it together “on impulse” on Tuesday afternoon. There’s no love lost between the two Casasanta and Gruber. Gruber attacked Cassantra’s wildly successful MacHeist when it first launched, only to praise it later when MacHeist started running paid-advertising on his site. (All Gruber’s posts on MacHeist — good and bad — are here). “I never called someone a douchebag so many times in my life,” said Casasanta. Lots of people have called Gruber a douchebag, and a lot worse. Gruber may be influential, but he’s widely reviled for the very personal nature of his attacks — and the inability of critics to answer his charges, often because of the lack of a comments system. 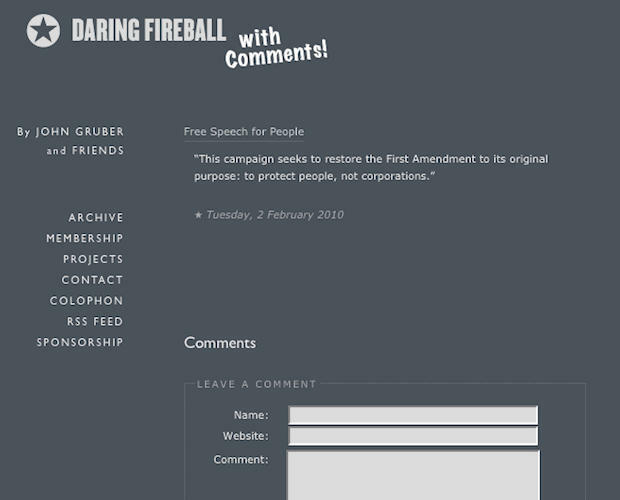 Casasanta noted that DaringFireballWithComments.com pulls in Gruber’s writing by RSS and serves the site’s ads, so Gruber shouldn’t lose any income — and may gain some. Gruber didn’t immediately respond to a request for comment. John Gruber's Daring Fireball is about to get comments, thanks to DaringFireballWithComments.net.